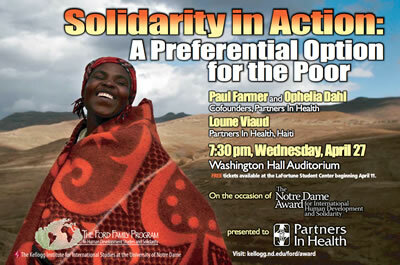 This week I was invited to an event honoring Partners in Health with the Notre Dame Award for International Human Development and Solidarity. Paul Farmer and Ophelia Dahl founded Partners In Health more than 25 years ago in Haiti to provide excellent health care for the poor through advocacy, service and training. Partners In Health has since grown to provide critical services in more than a dozen countries. The event itself, which included Mass, dinner, a public talk at Washington Hall titled “Solidarity in Action: A Preferential Option for the Poor” and a reception, was an experience, as I’m not often engaged in happenings at this level. The invitation was extended to me as part of my work with the Ford Family Program in Human Development Studies and Solidarity at a partner school Uganda Martyrs University. 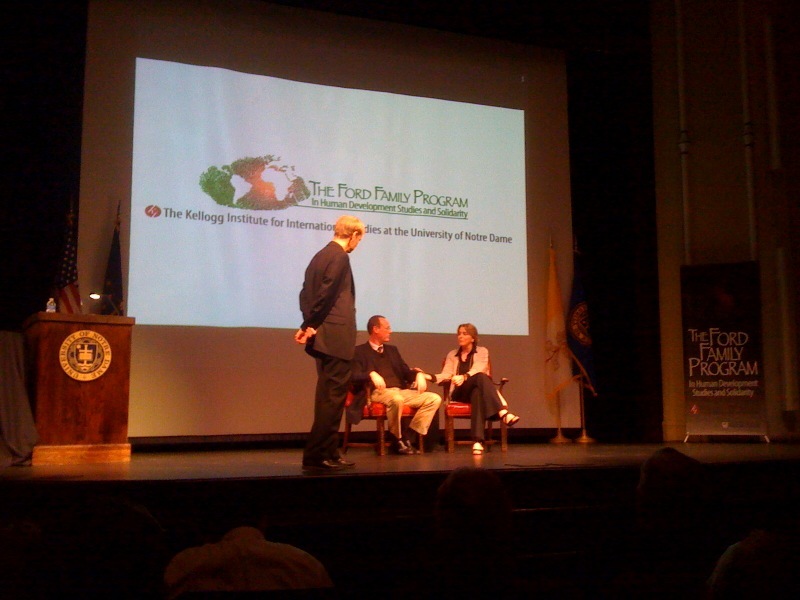 The event was attended by a number of high level university officials, deans, officers, President Jenkins and Fr. Hesburgh….as I said, this is not my typical crowd. Of course, we were also live streaming the Washington Hall event, so I was doing ‘double duty’ making sure we could share this great event with the world. I already had a great deal of respect for the Partners In Health organization, but after this happening I have a new found admiration for their work, their leadership and their vision. After the public talk/lecture I attended the reception in the Main Building and had the opportunity to talk at length with Ophelia Dahl about the intersection of technology and international development, also known as the growing field of ICT4D. Partners In Health was instrumental in the area of Electronic Medical Records (EMR) and the development of OpenMRS, which is a widely used and supported open sourced software for electronic medical records. We also discussed mobile applications like FrontlineSMS and the growth of mobile banking services. She was especially interested in my work with the ND Haiti Program on the mobile payment project for the Salt workers. A couple of things she said, have stuck with me, like thanking me for what I do. Really? Thanking me? I’ve done very little in this field, and was humbled that she would thank me….wow! The other thing she said, as we were talking with a student from Rwanda interested in international development was this – “find what you love to do, and pursue it”. This is a lot of common sense, but sometimes it takes hearing that from someone that has done some incredible things, to really sink in. Of course I’m still processing this event and these conversations from last week. It was a very inspirational evening.